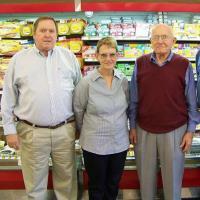 The Edwards Family is celebrating their 66th year in the grocery business. The celebration will end on October 31st. The business was founded by Joe S. Edwards in Princeton. The business was named in honor of a grandfather, Vine Edwards, and was originally called Vine Edwards and Sons. The first store was built on Center Street in Downtown Princeton. The first store initially sold general merchandise like horse collars, fertilizer and plumbing supplies. But you could still buy 6 Coca Colas for 25 cents. The family expanded with stores in Kenly, Four Oaks, Selma, Pikeville, LaGrange, Smithfield and Benson. Later, they sold all the locations except Smithfield and Four Oaks. Today, Mr. Melvin Edwards is the patriarch of the Edwards family. Working with him in the business are his daughter Phyllis, and son Bruce. Not pictured is son Steve and nephew Bill Joe Edwards. The Edwards, known for their Christian faith and giving back to the community, now operate two stores, the Edwards IGA Food Liner on North Bright Leaf Boulevard in Smithfield and the Edwards Food Store on Highway 301 in Four Oaks.